Now that fall has arrived, pumpkins are everywhere. Porches are decorated with all sizes and not just traditional orange pumpkins. Shades of orange range from muted tangerine to vibrant red-orange. Green pumpkins are colored deep forest hues and soft mellow sea green. And some are creamy white and bright eye opening white. I remember when I was a kid, Dad and I carried pale-colored pumpkins from the garden that were either carved into simple jack-o-lanterns or cooked for Thanksgiving pies. But what’s most surprising today is the many recipes for foods and beverages made from pumpkins. When Mom roasted the seeds, we thought we’d eaten all things pumpkin. While turning the pages in a magazine that featured the savory side of pumpkins, it occurred to me that I could serve pumpkin for breakfast, lunch, and supper, and offer pumpkin snacks in between. Then searching online, I discovered enough recipes for pumpkin menus for a week, and never repeat, but that might be pumpkin overload. A quote from Country Living magazine states, “The only thing better than fall mornings are fall mornings with pumpkins.” I’ll start the day with pumpkin spice flavored coffee and serve eggs baked in a mini pumpkin with bacon and roasted squash. I’ll bake maple pumpkin scones and offer pumpkin bread, to replace boring banana bread, for those who would turn up their noses at scones. And pumpkin butter will up the flavor when spread on scones and bread. For a mid-morning energy boost, how about a pumpkin protein shake topped with spiced pumpkin whipped cream and cinnamon? Soup, the savory side of pumpkin, for lunch. In less than fifteen minutes, I can make traditional pumpkin soup with chicken broth, onion, and garlic. Two other recipes are tempting: Pumpkin Chili and Coconut Curry Creamy Pumpkin Soup made with coconut milk. What’s better than cornbread with soup? How about pumpkin cornbread? Afternoon snacks have to be roasted pumpkin seeds. Just like Mom made with the pulp wiped off the seeds, but not washed. Seasoned with butter and kosher salt and roasted about 25 minutes. But I’m tempted to try Rosemary-Parmesan Pumpkin Seeds or Taco-Lime Pumpkin Seeds. Husband likes pasta so I’ve narrowed the dinner choices to ravioli or fettuccine or lasagna. Pumpkin Ravioli with Sage Brown Butter or Pumpkin Goat Cheese Fettuccine Alfredo or Cheesy Pumpkin Lasagna. All can be served with Roasted Pumpkin-and-Baby Kale Salad and Pumpkin Butter Brie Pull-Apart Bread. The recipes for pumpkin desserts are limitless. Cakes, tortes, cookies, bars, rolls, cobbler, crème brulee, mousse. But I really like plain pumpkin pie, like Mom made using a recipe she tore from the wrapper of a can of evaporated milk sometime in the 1950s. So many pumpkins. So many recipes. But I have an orange one and a couple of white ones on my porch, and I really won’t serve or eat pumpkin all day long. But I’ll venture beyond roasted seeds and pie. There are just so many choices. Some people shop on Friday after Thanksgiving. It’s their tradition. One year, I thought I should see what the hullabaloo of Black Friday was all about and went shopping. I vowed to never again set my foot inside a store on the biggest shopping day of the year. That day has held other traditions for me. When I was growing up, that Friday was hog killing day. As a teacher, Dad had the day off and the temperature was right for handling fresh pork. By day’s end, pork chops, sausage, ribs, and roasts filled our freezer, and salted down ham and bacon slabs hung high from the barn rafters. That night’s supper was fried pork tenderloin, Mom’s Martha White biscuits (slathered with butter), and molasses. In my young adult years, I started projects on Friday. I made Christmas gifts – cross-stitched samplers, jars of jelly, ceramic bowls. I even sewed a housecoat for Granny and a pantsuit for Mom. And I made both my children Christmas outfits: Daughter’s dress, Son’s vest. Seems the time between Thanksgiving and Christmas was longer then. When Husband and I moved our family to this house in the woods, Friday was the final fall cleanup-the-yard day. Husband spent all day and Daughter, Son, and I helped. We picked up sticks. We raked. We blew. We dragged huge mounds of leaves on top of a tarpaulin from our grassy yard to our leaf-covered woods. Yard work was finally finished until spring. Then came the year when Husband and I hosted a pancake breakfast on the day after Thanksgiving. Daughter and her friends had scattered to colleges and jobs after high school graduation. From Texas to South Carolina, from Kentucky to Florida, these sixteen girlfriends separated, but remained close friends. In twos and threes, some attended the same university, but Daughter went alone to a Berry College and missed her friends. When I heard that all were coming home for Thanksgiving, I thought of the mornings that these girls had eaten pancakes around our dining room table after slumber parties so I sent out an invitation. “Pancake Breakfast. 10:00 a.m. Friday after Thanksgiving at the Ray’s house.” And they all came! They hugged. They laughed. They cried. They rejoiced to be together again. And they ate every pancake and slice of bacon put on the table. Some stayed an hour, some until mid-afternoon. A tradition had begun. Once a year for ten years, our entrance hall banister was covered with car keys. Purses slung in corners. Shoes kicked off under the table. These young women giggled like teenagers walking the halls of Cookeville High School. Not all came every year, but at their request, I continued to flip pancakes. They talked about weddings, in-laws, jobs, moves, and babies – all good things that eventually brought this tradition to its end. I don’t have plans for hog killing or sewing or yard cleanup or pancake breakfast this year. Husband will find the Hefty garbage bags filled with garland and I’ll find the red velvet bows and we’ll hang them across the front porch. I’ll set up the Christmas caroler family and the tabletop Christmas tree that’s decorated with shells. Christmas decorating will begin. But not too vigorously. Friday after Thanksgiving should be a restful day. And surely there’ll be a football game to watch. Blowing leaves. It’s a chore I like and that’s a good thing since Husband and I live in the woods. I like the earth smell. I like being outside on crisp, cool, sunny days. 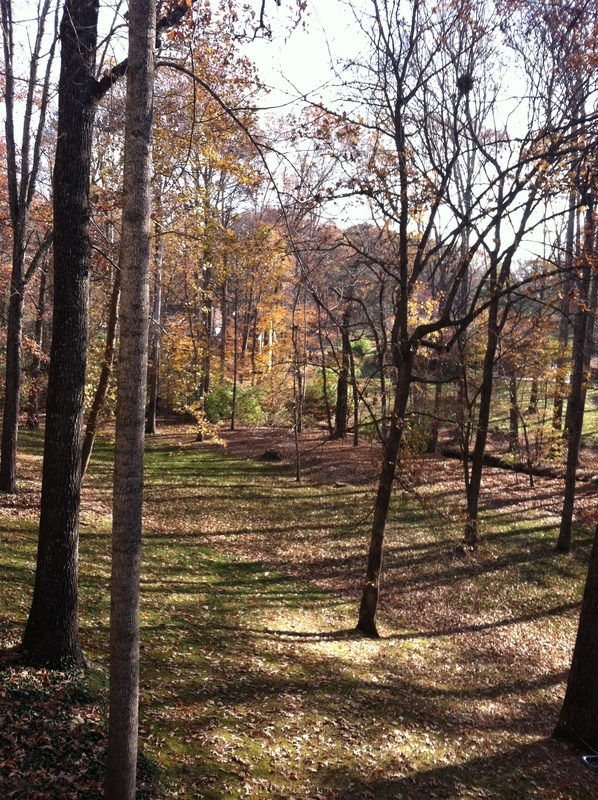 And blowing leaves from our driveway and yard gives me thinking time. My mind wanders. The squirrels’ storehouses must be full. There’s a multitude of acorn caps around the oak trees, and the ground is littered with fragments of shells and hulls under hickory trees. Those furry little critters have really strong jaws and teeth to break hickory nuts for such a meager amount of meat inside. This would be a good year to make Christmas tree ornaments using the balls from the sweetgum trees. Wonder if my Grands would think it was as much fun as I did when I was a kid? I sprayed gold paint on the spiky balls gold and sprinkled multi-colored glitter on them. Anything with glitter is fun. Leaf blowing vs. raking. Blowing is much easier and gets the job done faster, but probably doesn’t burn nearly as many calories. (I looked this up. Based on my weight, raking leaves burns about 250 calories per hour and blowing, about 200.) 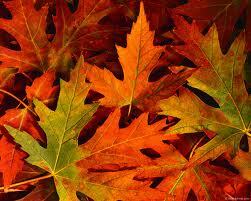 Blowing makes a loud noise; raking, only the rustling sound of the leaves. My green furry earmuffs, which I wear to muffle the loud noise of the electric leaf blower and to keep my ears warm, are ugly. I’ve had them since I was about ten years old and they still fit. People have said to me, “Oh, you live in the woods? Then you don’t have yard work.” They’ve never picked up sticks and twigs after a storm. Or removed leaves from their driveway twice a week from mid-September through December. Or done the whole yard at least five times. They’ve never lived in the woods. How can a sycamore leaf be as big as a platter? All the trees have produced a bumper crop of leaves this year – more and bigger. And the fall leaf colors have never been brighter. Yellow maples, orange-red and brown oaks, red sweet gums and dogwoods, spotted brown sycamores, yellow and brown hickories. I’m thankful that I can walk and carry a leaf blower. I’m thankful that our two oldest Grands are willing to help rake and blow leaves and pick up sticks. 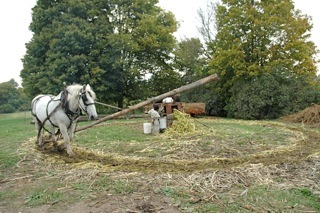 They don’t have to bend far to get the sticks. I love when one says, “When is it my turn to blow leaves?” and I’m glad to pay them for their work. I hate winding up the 100-foot extension cord on the storage reel. It takes three minutes; I’d rather continue blowing leaves for another half hour. As I begin winding the cord around the slick plastic reel the cord slips and won’t stay put, and then I always scrap my knuckles on something while turning the handle. I tell myself that putting away the tools is part of the job. Leaves continue to fall during the two hours that I’ve been blowing leaves from under shrubs and to clear the driveway. I look up. From the very top of a huge oak tree, one single leaf drifts over my head and lands at my feet. I’ll get it next time. As we drove toward Monterey, I pointed out the colors of the leaves. Orange, yellow, red. “Do you see the huckleback brown?” Ruth asked. What color? Surely, I didn’t understand what she said. “Huckleback brown.” I don’t know that color. “There’s lots of huckleback brown. Look.” Little sister Elaine chimed in, “That’s not a real color.” Ruth said, “It is, if I say it is.” End of discussion. I told my Grands that last year as we drove along a country road we passed a field that had big animals – elk, moose, deer. Ruth said, “I remember! Elaine, they’ll be on my side. Look over here.” We slowed down as we drove past the pasture where we saw the big animals last fall, but we didn’t see anything except a pond. Ruth said to Elaine, “You should’ve seen the big elk.” Elaine asked what they looked like. Ruth said, “Big like deer and they had horns. Antlers! Is that what they’re called, Gran?” I explained that only the males have antlers and when Elaine asked why, I took the easy way out, “Because that’s the way they’re made.” All was quiet in the back seat for a few minutes, and then Ruth said, “That’s not fair. Girls need antlers, too. We made a quick tour of the store, slowing down to look at the doll-size high chairs and cradles and for both Grands to rock on the wooden hand-made rocking horses. Ruth chose pink and green sprinkles; Elaine, blue and red, and I bought a dozen sorghum suckers, some to eat and some to take home to share. Elaine immediately ripped the cellophane wrapper off her sucker and the candy fell onto the concrete store floor. I offered her another sucker, but Ruth intervened and said, “It’s okay. The floor doesn’t look dirty.” Elaine picked up her sucker and stuck it in her mouth. After we’d buckled seat belts in the van, Ruth asked, “Gran, did we miss rest time?” I explained that the ride home would be a quiet rest time. “So, Elaine, you can go to sleep, but I won’t,” Ruth said. I didn’t even ask if anyone noticed how the Muddy Pond community is different from Cookeville. This field trip was about the sisters. Middle child, Ruth, had a chance to be the leader, and her independent toddler sister, Elaine, accepted her role as the follower. Elaine slept all the way home. Ruth talked. “What happened to that pumpkin?” my young Grand asked. She pointed to what looked like a normal pumpkin to me so I asked what she meant. Why did she think something had happened? “It’s a funny color. Did it fade?” she asked. No, it didn’t fade. It was a tannish-orange colored pumpkin like the ones that everyone cut to make jack-o-lanterns when I was a kid growing up in Pickett County. A plain pumpkin. The same kind of pumpkin that Mother cut up, scooped out the meat, and used to make a pumpkin pie. A field pumpkin. Field pumpkin – an apt name. Dad grew them in a field, usually close to or in the cornfield. He and I would walk among the dry corn stalks, which scratched and scraped my arms, searching for a perfect jack-o-lantern pumpkin. It had to sit flat and not tip over. The skin had to be smooth with no ugly bumps, at least on one side. I liked a tall, skinny pumpkin. Then there was plenty of space for a face to be cut out. Triangles for his eyes and nose and a mouth with jagged teeth. And we’d dig out a place inside on the bottom to stand a tall, maybe a six-inch tall, candle. A real candle. My Grand’s questions made me notice all the many varieties of pumpkins available at Farmer’s Market that Saturday morning. So how many kinds are there? 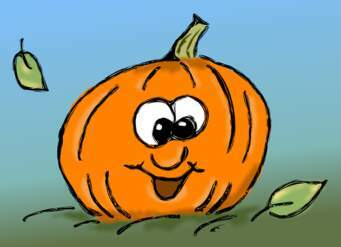 A website for seeds (http://www.johnnyseeds.com) lists 67 pumpkin varieties. Looking at the pictures, I counted 45, almost 70%, bright orange ones. Only one was the color of every jack-o-lantern my daddy helped me cut. The Dill’s Atlantic Giant variety commonly grows to be 100 pounds and can be up to 1500 pounds. I wonder if the 1405 pound pumpkin that won first place for giant pumpkin at the Great Pumpkin Festival in Allardt, Tennessee a couple of weeks ago was a Dill’s Atlantic? While my Grand and I wandered through Farmer’s Market that day, I told her that she could choose a pumpkin to take home. One that would be all her own. She chose a tiny one – bright orange of course – that just fit in her small hand. I’m pretty sure it’s a Wee-B-Little. And I bought two pumpkins for fall decorations, although my Grand said they probably weren’t real pumpkins because they weren’t the right color. A soccer ball size white one and a green and white striped one that looks like a big gourd. And we bought a tall, bright orange one to cut for a jack-o-lantern. Why choose a faded pumpkin when you can have a bright orange one? Tis’ the season for leaves. Those beautiful yellow and red and orange leaves that light up Tennessee mountains. Those beautiful leaves that fall to the ground. Those leaves that aren’t so beautiful when they cover my yard and deck and driveway. Especially when it rains. I love living in the woods. I love to watch tiny buds burst into leaves in the springtime, and I love the comfort of a shade tree. And nothing in nature is prettier than the colors of autumn. But when leaves begin to fall from trees, they spell work. Almost thirty years ago, Husband and I built a house in the woods. Through the years, we’ve lost trees to disease and storms, but it seems that each year our trees produce more and bigger foliage than the year before. We’ve used every method to remove leaves. Raked, mowed, and blown. When our children lived at home, we ‘did leaves’ as a family undertaking, and now we usually, and happily, hire out the job. Some people say to let all the leaves fall and then get rid of them one time. Well, if we tried that, we’d be up to our eyeballs in leaves. At least, up to our knees. Someone will have to blow or rake the leaves in our yard at least three times between now and December. Early in our marriage Husband assumed the responsibility of yard care, but because I’m the one who loves living in the woods (he’d be happy in a walk-up apartment) and we need to see where to drive, I try to keep the driveway leaf free. I haul out my electric leaf blower, a 100-foot extension cord, and a rake. I spend as much time untangling that long extension cord and moving it from an outlet on the front porch to a basement outlet as I do blowing leaves. And I use a rake where I can’t reach with the blower. Two hours later, I can see pea gravel and concrete once again. The next day, leaves litter the driveway. By the second day, especially if there’s been breeze, even a mild southerly breeze, I can’t walk the length of our driveway and not step on leaves. Time to haul out the leaf blower. My Grand says he’s saving money to buy a Lego set. He’ll have enough money soon. There’s plenty of work for this boy.